The opportunity to own the largest broadcaster in a consumer market of 1.3 billion people doesn’t arrive all that often; even more rarely does it come after a single-day 26 percent rout in the stock. 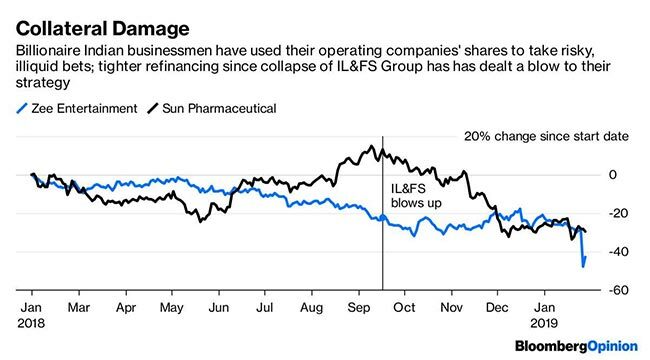 The special situation has arisen because of Indian infrastructure financier-operator IL&FS Group’s sudden $12.8 billion bankruptcy. Analysts who believed the tremors would reach other shadow-banking entities like Dewan Housing Finance Ltd. were half right. Yes, Dewan’s loan disbursements fell 95 percent from a year earlier in the December quarter amid pressure on the mortgage lender to deleverage. But the shock waves have now spilled beyond finance to reach the glamorous world of television content. Subhash Chandra, the founder who controls 41 percent of Zee Entertainment Enterprises Ltd., is putting half his shares on the block after making wrong-way leveraged bets in unrelated industries such as infrastructure, a mistake the tycoon acknowledged in an open letter on Friday evening. Although the stake-sale plan has been known for a while, the official explanation so far was that Zee wanted a partner to become a “global media-tech player.” It’s clear now that the real reason is the debt load of Chandra’s Essel Group. BloombergQuint estimates the burden at 170 billion rupees ($2.4 billion) across 87 operating companies as of March 31, 2017. The collapse of IL&FS found a mention in Chandra’s mea culpa. The implosion of the highly rated lender raised financing costs for everyone who had borrowed short-term funds to invest in long-term assets such as roads, power stations, waste-management plants, or in the case of drugmaker Sun Pharmaceutical Industries Ltd.’s billionaire founder Dilip Shanghvi, apartment complexes and windmills. The collateral for these forays in most instances was shares of their successful, publicly traded operating companies. But as both Shanghvi and Chandra recently found out, collateral can wear thin very quickly. All it takes is a whistleblower complaint of financial irregularities or a news article insinuating links with a company allegedly dealing in unaccounted-for cash to make the stock price plunge. Strenuous denials or defamation lawsuits can’t quite set things right with creditors left edgy by IL&FS’s defaults, though a weekend meeting with lenders does seems to have bought Chandra time to conclude the sale of his crown jewel. Zee, where I worked briefly in the 1990s, is a content powerhouse with a 20 percent share of India’s traditional television viewing market. The network also boasts 35 percent Ebitda margins despite heavy investment in Zee5, a fast-growing digital app. There’s no confirmed bidder yet, but according to a report in the Business Standard, Zee may be of interest to Amazon, Apple Inc., Tencent Holdings Ltd., AT&T Inc., Singapore Telecommunications Ltd., Comcast Corp. and Sony Pictures Entertainment Inc. If that weren’t already a long list, Reliance Jio Infocomm Ltd., a telecom operator controlled by Mukesh Ambani, India’s richest man, is also likely to join the contest, the article said. If Ambani snags the asset, his triple play of carriage, content and commerce could deal a blow to Amazon boss Jeff Bezos’s multibillion-dollar plan to dominate e-tailing in India. Demand for digital video in India is exploding as Ambani drives down data prices. 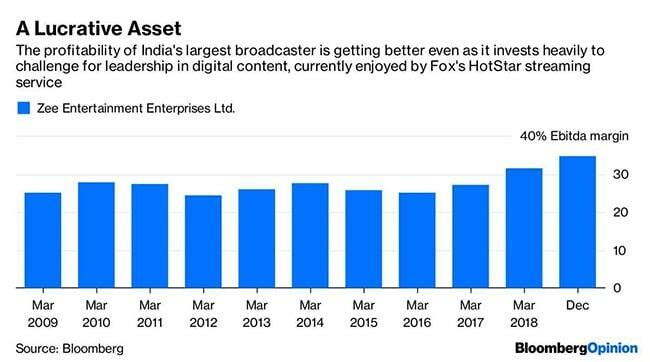 With an enterprise value of $4.8 billion, and more cash than debt, Zee has a good chance to take on 21st Century Fox Inc.’s local-streaming platform, HotStar, as well as Netflix Inc. and Amazon.com Inc.’s Prime.